There are two options for routes to take when walking from the Giant's Causeway to Portballintrae. The more scenic of the two routes is not yet marked on OS maps and it continues around the cliffs to Bushfoot Strand. The alternative and more direct option is the one highlighted on the OS maps and follows the trainline as far as the Bush River. The option starts starts on the path behind the Causeway Hotel and continues to the north-west along the edge of the cliff-top. Although it is not currently marked as the Causeway Coast Way, the path can still be identified on any of the OS maps. The trail follows along the cliffs and allows final views of the main Causeway before rounding the corner and facing into the small inlet of Portcoon. Before reaching Leckilroy Cove, the trail passes a World War II memorial stone which has been erected in recent years. It commemorates two pilots who died in a plane crashed in July 1942. The training flight had taken off from Limavady before getting into difficulty and crashing near this site . After climbing a flight of steps, the Causeway Coast Way soon rounds Runkerry Point and starts to descend towards the shoreline at the old Blackrock salmon fishery. The splendid Runkerry House sits above the trail to the left. The trail soon crosses a small footbridge over the Runkerry Burn to meet the train line. The steam train operates during Summer months on the line for the 3km between the Giant's Causeway and Bushmills. The trail then leaves the trainline after 600m for the Bush River. The following 1km includes a wooden gangway along the course of river and then crossing a footbridge to finally reach the edge of Portballintrae at a large car park. A signposted detour of around 100m leads up the hill to the left for the Lissanduff Earthworks. These large circular earth banks are locally known as the 'Cups and Saucers' and are thought to date back as far as the Iron Age. The final ⅔km of this section leads from the car park onto Beach Road and around the corner, contouring the small bay to reach the Bay View Hotel. 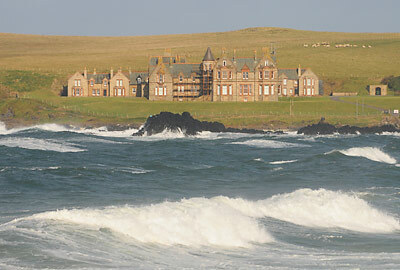 The alternative option is to take the direct route from the Giant's Causeway to Portballintrae. Starting from the Visitor's Centre, the trail leaves to the south-east, down towards 'The Nook' pub and restaurant. The Way avoids the main road, opting for the Runkerry Road. The Causeway Train Station is around 200m walk around the bend. The steam train runs on a narrow gauge track and operates during the Summer months from Giant's Causeway to Bushmills. A return journey on the train provides an ideal opportunity to visit the world famous Bushmills Distillery which is around 4km away. The path for the Causeway Coast Way follows this trainline for around 1km before turning off to follow the Bush River at the foot of the sand-dunes. The next 1km is mainly on a wooden gangway along the course of river before crossing the river to reach the edge of Portballintrae. At the carpark, there is signposted detour of around 100m leads up the hill to the left for the Lissanduff Earthworks. These large circular earth banks are locally known as the 'Cups and Saucers' and are thought to date back as far as the Iron Age.